The Explore 10 has been designed to provide a fast and manoeuvrable fishing platform with a smooth flowing, almost silent hull. The narrow and flared bow enables you to slice through the chop and makes for a very fast and comfortable ride. The included rudder system adds additional control and manoeuvrability. The Dashboard provides a multitude of mounting points for your optional accessories, as well as having mounting points for the included swivel rod holder. There is even an included drink holder and catch ruler. There are four flush mounted rod holders, as well as the central swivel rod holder, giving plenty of options for anchored fishing or trolling. The moulded-in centre storage well (L 66 x W 12 x D 15cm) offers plenty of space to stow all those bits and pieces you need close to hand. For the serious sports fisherman, there is a transducer compatible scupper, giving you a clear view of your quarry. The large click seal hatch on the bow (L 34 x W 17cm), which opens into the hull, is ideal for storing your rod collection. There is a large well at the rear is ideal for any additional kit. 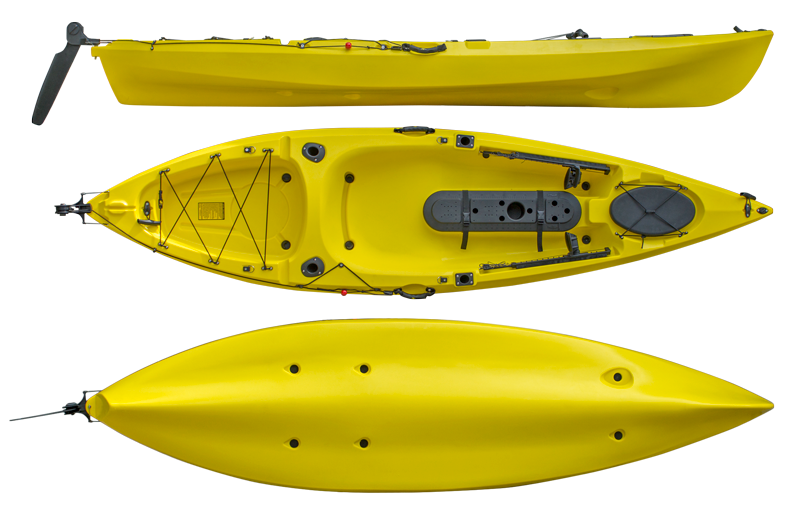 The Explore 10 is the perfect choice for anyone looking for a compact, faster, more manoeuvrable and easier to handle, fishing kayak.